AquaDunk on the Disney Magic. Credit: Disney/Jimmy DeFlippo. There is nothing quite like being surrounded by the great open ocean while enjoying some freshwater pools on the ship! 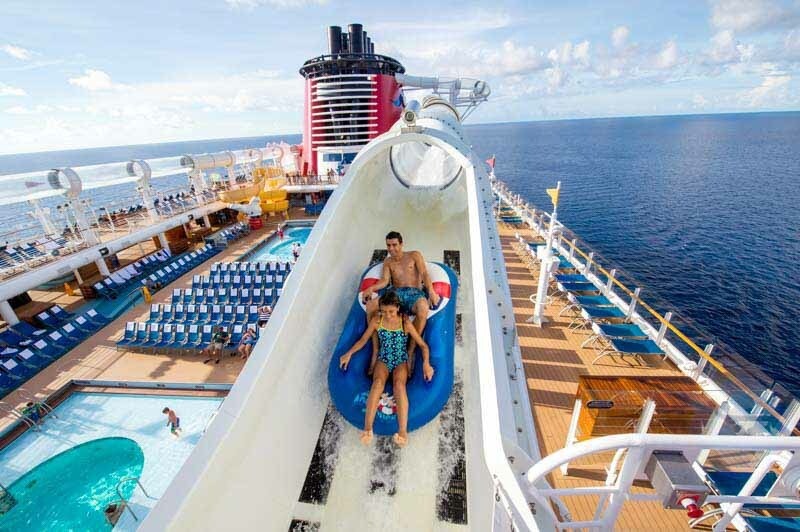 Pools and other water fun are probably the most popular areas of the entire cruise ship – for all the right reasons. Before you hit the water, check out a few things you may want to know before experiencing the pools as a family with young kids. With these two names being so similar, understanding the difference can be confusing! 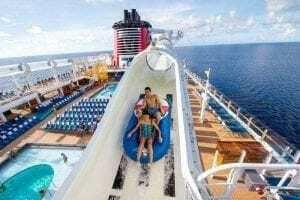 The AquaDUCK is located on the Disney Dream and Disney Fantasy. Children and adults can ride as long as they are 42 inches or taller. 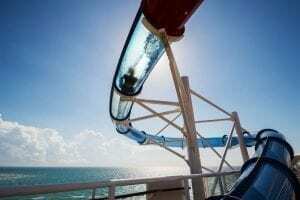 This is a water coaster with a two-person tube which is propelled by water through a tubing system around the ship. 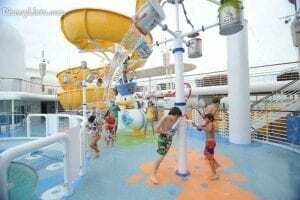 The AquaDUNKis located on the Disney Magic and was built with teens and adults in mind. For this one, you have to be 48 inches or taller to ride. 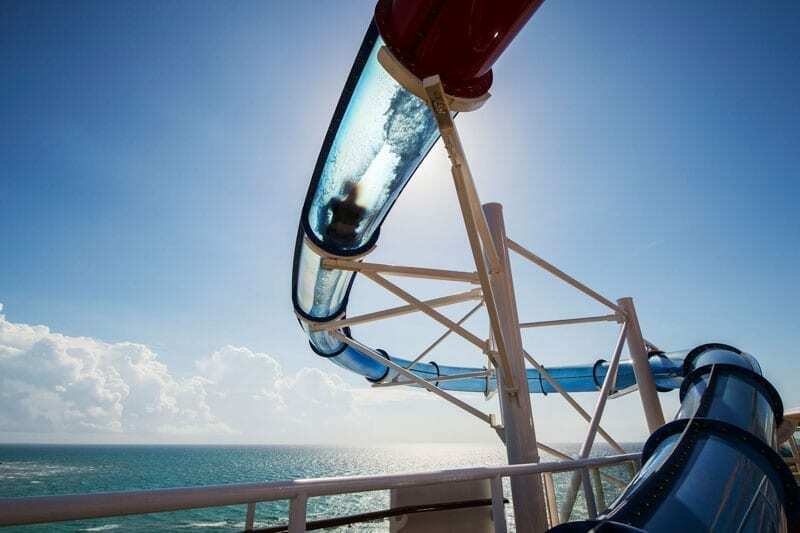 Step into a capsule-like tube, count down, and you’ll be dropped down a waterslide. AquaDunk is the more thrilling and intimidating of the two while the AquaDuck is the much more family-friendly experience. Towels are provided on deck, so you don’t have to worry about hauling them around or trying to fit them in your luggage. You can also leave the pool vests at home as these are provided as well. Personal floaties are allowed (such as water wings) but large floats like tubes or pool noodles are not. Snorkel gear is not permitted in the pools so save that for your day at Cape Canaveral! 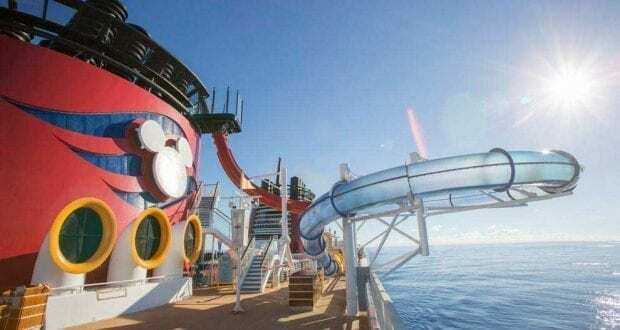 Your child is welcome to use goggles in all pools except when riding the AquaDunk on the Disney Magic. Lastly, if your child is still in a swim diaper, be aware that he or she will not be able to get into the pools, whirlpools, or use slides. Children that are not potty trained can wear swim diapers in the children splash areas. Keep sunscreen on the kiddos with reapplying regularly. The pools are open to the sun, so you’ll need to be aware of how your kids are doing. Hats, sunglasses, and swim shirts are helpful. There are some lounge chairs directly in the sun but do your best to grab one in the shade so you and your kids can have some time out of the sun when needed. Lifeguards are on duty whenever the pools or slides are open to ensure rules are being followed. Keep in mind that while there are lifeguards, adult supervision is still required for children under the age of 16. As parents, we felt reassured knowing lifeguards are present and attentive, but we too were right there where we could see our child and they could see us. 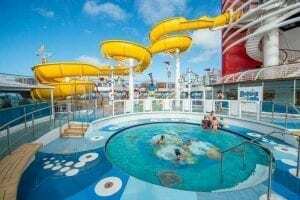 We think because it’s a cruise setting and people feel like their child can’t really go far, that they’ll just leave the babysitting to the lifeguards. We saw this several, several times. Lifeguards will do their best to help your child in an emergency situation – but they are not responsible for your child. 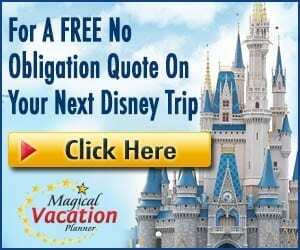 If the massive, pool front screen with Disney films being played isn’t enough, Cast Members are constantly offering games and activities for the kids at the pool. These games typically include some form of water play or allow kids to sit pool side to play. We’ve learned if you have a shy child, it is sometimes difficult to push them into the crowd to get them to join in. Don’t hesitate to let your child watch the games if they simply don’t want to participate. Keep an eye on your Navigator App as this will have a poolside game/activity schedule. It gets crowded… very crowded! To be honest with you, we were in shock at just how packed the pools got during peak hours. It seemed like every child on the boat was in the pool. 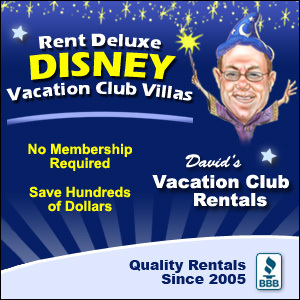 Disney does, however, have regulations and only allows a certain number of kids in the pool at once. Don’t expect your child to be able to get in and swim across the pool during peak times. It’s more like, get in and wade in one spot. 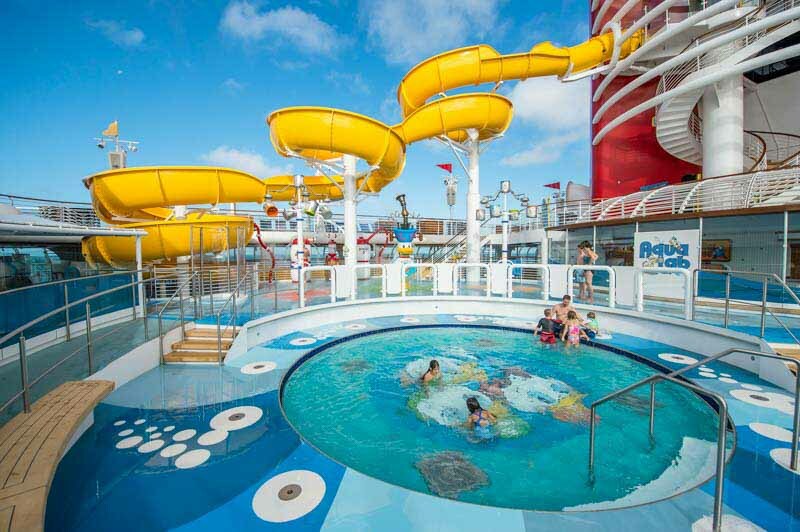 The small whirlpools located to the side of the pool areas on each ship are open for kids but again – it’s like taking a bath with 30 other people. Since we’re talking about the crowds, let talk about the best time to take a swim! The pools/slides are typically open from 8:00 am to 10:00 pm. They do have early closings if there is a special nighttime event on the pool deck. We’ve also seen random closures which seemed to relate to too many kids in the pool, an object in the pool, or other reasons we are unaware of. They did reopen pools rather quickly after these unexpected closures. The best times to swim are first thing in the morning or late in the evening. The middle of the day is peak time so avoid it if you’re looking to avoid crowds. Port days are another great time to swim if you don’t have many port adventures and find yourself back on the boat early. Something about swimming and the sun makes us hungry! Our kids always want a snack or drink when we go to the pool. The best thing about the cruise is all your poolside snacking and dining is right there. Just steps away from the pool and you can enjoy pizza, sandwiches, fries, fruit, chips, ice cream, water, soda – all sorts of stuff! Plan to take swim breaks and eat up at one of the convenient poolside dining options. Oh, and parents – there is an adult beverage called the “Drink of the Day” available at the poolside bars. Get a souvenir glass your first day and have a “drink of the day” refilled in the glass for a reduced price. Kids are happy, as are you! Have a blast splashing around on the Disney Cruise Line!